Eye to Eye is a confidential counselling service for young people in RCT. 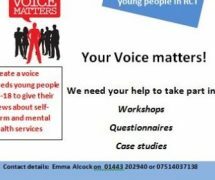 ‘Create a Voice’ needs young people 14-18 to give their views about self-harm and mental health services. 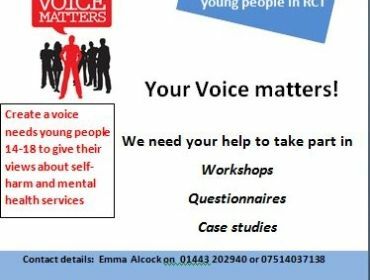 If you’re interested in helping out a vital service for young people, get in touch with Emma Alcock. Contact details: Emma Alcock on 01443 202940 or 07514037138.